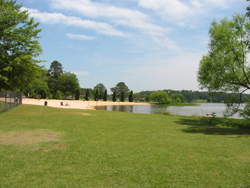 This beach and the park are located along the northern shore of Lake Acworth. The 90 acre lake is just south of, and empties into, Lake Allatoona. Acworth Beach is a busy place in the summer. 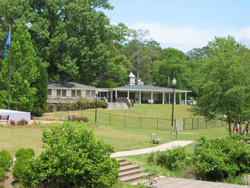 The beach and other facilities in Cauble Park attract visitors who come to enjoy the beach, lakefront walkways, picnic areas, and playgrounds. The beach is open for swimming from early June to Labor Day. 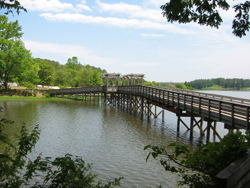 Cauble Park (the park where Acworth Beach is found) is located on Beach Street in Acworth, which is on the north side of Lake Acworth. There is a $10.00 parking fee for non Acworth residents on weekend days and holidays between Memorial Day weekend through Labor Day, from 8:30 AM to 6:00 PM. You can also walk into the park from a few other areas that are near Cauble Park. A series of trails connect Collins Circle to the park and there is a short trail and boardwalk that connects Winn Street to the south side of the park. There is a nice sand beach with a designated swimming area. The beach is open from dawn until dusk (Memorial Day weekend through Labor Day). No lifeguards are present. A bathroom, changing station, and showers are all located adjacent to the beach. There are a few individual picnic tables scattered around the park. A beach house, Pavilions and a Gazebo are available for rent (fees and reservations). If any of these facilities are not being used or reserved, some are available on a first-come, first-served basis (check the signs at each site). There is a grill, electrical outlets, and lights at each pavilion. The Gazebo is similar with the exception being the grill is adjacent to the covered structure. The group facilities vary in size. The smallest site can accommodate up to 25 people and the largest up to 80 people. The Community Beach House has a conference room, kitchen facilities, a dining area with tables and chairs, and restrooms. There is room for up to 100 people. It can be rented for a full day only. You will find a general set of rules and regulations regarding renting any of the group facilities towards the end of this page. This website is not affiliated with the city of Acworth; they are free to change or deviate from these regulations. You need to contact the city of Acworth Parks and Recreation Department to make reservations. 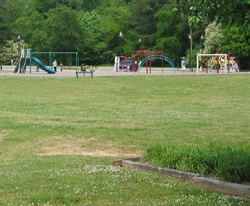 Two playgrounds are found in the park. Both have modern playground equipment - and generally see heavy use! There is a boat ramp at the east side of the park. 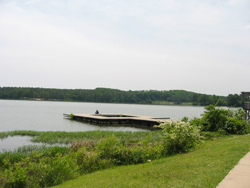 Gas powered boats are not allowed in Acworth Lake; electric motors, canoes, and john boats without motors are fine. There is a fishing dock in the park. 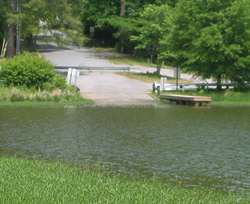 Acworth Lake contains channel catfish, largemouth bass, bluegill, redear sunfish, crappie, carp and bullheads. Fishing licenses are required. This memorial is dedicated to the men and women that have served in our country's military. The structure includes a display of the service flags of all the military service branches. A Flag Day Ceremony (June 14 at 11 AM) and Veterans Day Ceremony (November 11 at 11 AM) are held annually at the memorial. There are walking paths that wind through the park, including portions that pass along the edge of the lake. Concerts - A music concert is held in June and on July 4th. These concerts are part of the Love the Lake Summer Concert Series. The concerts are free. You can reserve a table for six, for a fee, for these events (call the city of Acworth at 770-917-1234). Paid reservations also include a parking pass for one vehicle. Easter Egg Hunt - The easter bunny and 10,000 eggs! The Easter egg hunt is held two Saturday's before Easter, at 10 AM. It only lasts a few minutes and afterwards children can get their picture taken with the Easter Bunny. Children under 12 can participate and are broken up into three age groups. There event is free. Fourth of July Fireworks - The 4th of July is a busy day in Cauble Park. After the music, around 9:30 in the evening, the city of Acworth holds its annual fireworks show. This event is free. You can reserve tables for the day (see the concert information above). You can park at City Hall, the Post Office, and the Acworth First Baptist Church and catch a free shuttle to the park, beginning at 12:00 PM. This website is not affiliated with the city of Acworth; they are free to change these regulations at any time. The rules and regulations you are informed of and/or given by the city are your guide as to what you need to do, or not do, when you rent a facility in the park. Swimming is only allowed in designated areas, from Memorial Day weekend through Labor Day. The beach is open from dawn to dusk. The park is closed from 11 PM to 7 AM. Pets are not allowed on the beach or playgrounds; all pets must be on a (6 ft or less) leash and attended at all times. No littering in the park or polluting the lake. No smoking in the restroom areas or in the fenced area around the Beach House. 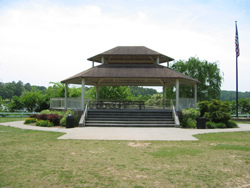 Rental of a pavilion does not allow a group to hold a special event, festival, fundraiser, etc. without the approval of the Acworth Parks director. You cannot drive into the park even if you are renting a facility within the park. DO NOT drive your vehicle into the park to set up or drop off your party supplies. You do need to clean up after yourself. Trash should be put into trash bags and placed in trash cans. If you are using the Beach House you will need to mop, in addition to other cleaning (clean the stove, refrigerator, counters, bag trash, etc.) The city does inspect the rented areas the morning after they are used. You cannot bring any additional grills into the park. Cauble Park is a public park and is public property - you do not gain exclusive rights to the entire park if you are renting any of the facilities. No rental fees are refunded. If it rains, you can reschedule your rental date to another day. To do so, call the Acworth Parks and Recreation office within 90 days of the rental date to reschedule. The city is not responsible for items left in the pavilions. Rented facilities are open the same times the park are open - you cannot use these facilities before 7:00 AM or after 11:00 PM. You will be granted use of a limited number of parking spaces when you rent a facility in the park. This does not mean you have a reserved set of parking spots but it does allow a certain number of vehicles that are associated with your party to park for free. You must tell the gate attendant which pavilion you are using when you are entering the parking area.